Here’s my take on the iconic Bruce Springsteen album cover originally photographed by the brilliant Eric Meola. This idea posed some challenges as with a tight time frame I could not source a decent stormtrooper costume. 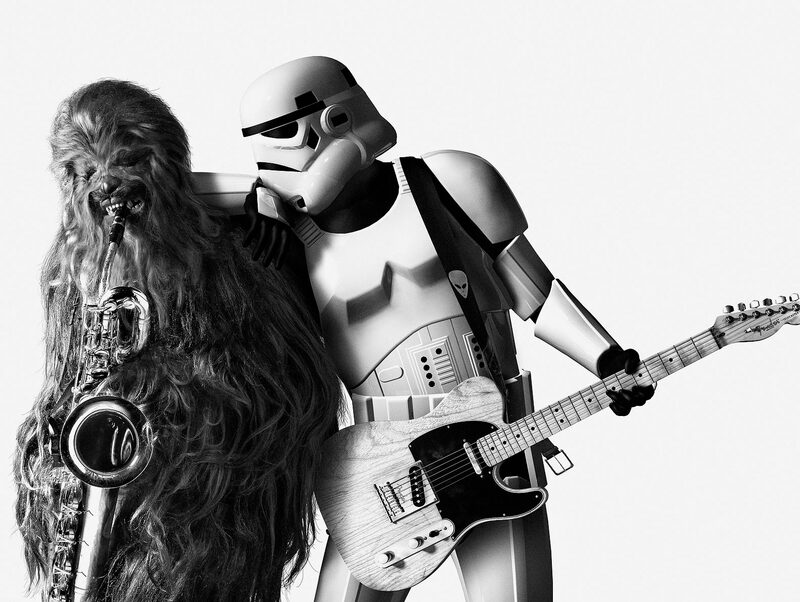 My Stylist, Do Walschots did manage a great Chewbacca outfit as well as saxaphone. We shot the Chewy character in studio posed with the sax with a Hasselblad H3DII camera. The storm trooper was rigged, posed and rendered in Maya. The Fender Telecaster is also CG and was rendered in a separate pass in Cinema 4d (it was just easier to do it this way as the Tele was native C4D format and I could avoid translating the c4d file to something Maya could understand). The guitar strap was photographed later and the whole lot composed in Adobe photoshop. I added a nice film grain to the image to lend it a period look as well… way back back when we all we had was film! Hope you enjoy this latest image as much as I did creating it. Many thanks go to all the folks at Terzers Studio in glorious downtown Grand Rapids, MI. This is a top notch, super chic place to shoot with wonderfully nice staff. Also, Do Walschots who produced, and styled this last round of samples and my son Chris Jr. who assisted. Thanks for the heads up Shawn! Would love a poster of this! Thanks Mark. No plans as of yet for a poster but will keep you posted.